Dry Riser Testing is not always plain sailing Unfortunately we are finding more and more systems to have leaks due to poor workmanship during installation. Just recently we completed some Dry Riser Testing in a new block and found out very quickly there was a problem. Water had flooded the first floor and unfortunately entered two dwellings. Our engineers did what they are trained to do. They drained the system in a timely fashion and mopped up any remaining water as best they could. They had checked the valves and visible pipe work prior to the test in accordance with BS9990 2015 and found no issues so they centred their attention at the first floor. The engineers opened the wall up and found the installation to be incomplete. The picture shows the ‘Tee’ with no valve and no plug. Apparently this system was fully commissioned after installation. Someone then saw fit to partition the wall with an open end staring them in the face. Luckily minimal damage occurred. 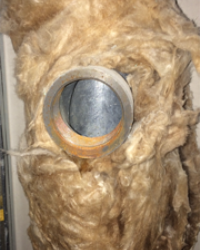 Our engineers carried out remedial repairs, fixed the issue and put things right. As a result the Dry Riser Testing was then completed. A good job very well done in pressurised circumstances. If you require any assistance with your Dry Risers then please contact us here or telephone us on 0800 027 2480.